The garden shed often ends up being nothing more than a storage space for broken lawnmowers and rusty garden tools that never get used. We’re always reluctant to throw things away so they get added to the pile. It’s such a shame because that’s an entire space that you could be using, but instead, you’re just wasting it by filling it with junk. There are so many things that you could use that old garden shed for if you just give it a bit of a makeover. So, get in there and clear it all out, then you can try one of these great shed ideas. 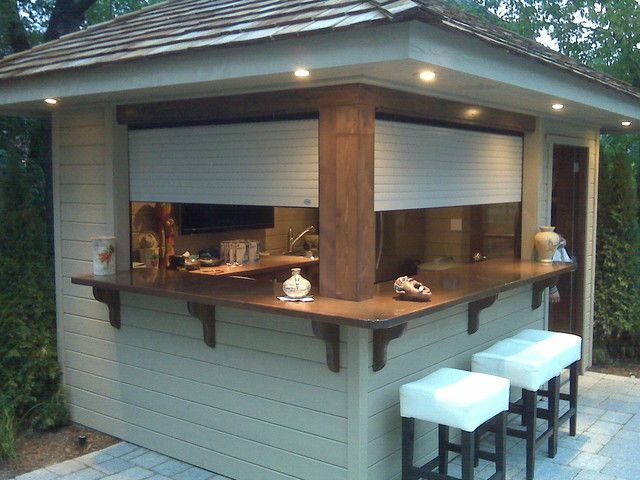 During those summer months, there’s nothing better than a good BBQ, and you can really take it to the next level by building yourself an outside bar. All you need to do is get yourself some stools in there and put up a simple bar. Stock it up with a few fridges and you’re good to go. If you’re serious about it, you can set up your own beer brewing station in the back and fill the bar with your very own drinks. Your friends will definitely be impressed next time you invite them over for the afternoon. As the kids get older, they aren’t going to want to hang out with their parents all of the time. They want their own space which puts you in a bit of a tricky situation. It’s important to give them that space but at the same time, you need to know that they’re safe. Turning the shed into a space just for them is a great solution to this. If you put in underfloor heating, they can stay in there during the evenings without getting cold. Set it up with a few bean bags so they can invite their friends over, and if you’ve got power out there, put a TV in there for them to watch. They’ll be happy to have their own space and you can get a bit of time to yourself in the house as well. If you’re fascinated by the stars, there’s no better way to use your shed than a stargazing room. It’s a great way to turn the garden into a family space. In the winter, sitting outside in the freezing cold to see the stars isn’t anybody’s idea of fun. By modifying your shed, you can enjoy the skies all year round and still be comfortable. Get a few heaters in there and put a skylight in the roof, that way you can set up your telescope and stay in there all night long. It’s a bit of an odd use for a shed, but if you’re passionate about your food, you can make your very own smoked meats at home. They’ll be far better than anything you can get in the store and even though it takes a bit of time, it’s certainly worth it. Doing it in the house can get pretty smelly, so the shed is perfect for it. It’s also an incredibly easy space to set up because all you need to do is clear out the junk and give it a clean before putting some bars along the ceiling to hang things from.